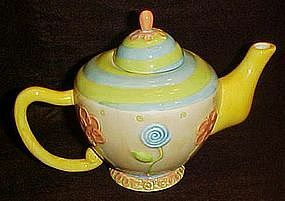 Adorable sweet little teapot made of glazed ceramic, with that Mary Englebright look. Yellow, pink, blue, and green hand painted pastel colors. Flowers have an applied relief. Measures 5 1/2" tall, and just the right size for about 2 cups of tea. Perfect condition.